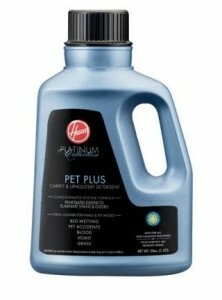 The Hoover Platinum Collection Pet Plus Carpet-and-Upholstery Detergent AH30035 works beautifully at getting rid of tough stains like pet accidents, vomit, blood, grass stains, and more. This detergent is compatible with all deep-cleaning machines and it leaves a fresh linen scent. This professional-strength formula is approved by the Carpet & Rug institute. It contains a concentrated enzyme that penetrates deeply to remove stubborn dirt, stains, and even unpleasant odors. This detergent is especially fantastic at removing pet messes. I’ve got lots of cats to deal with in my home and this stuff is fantastic at helping me clean up after those little buggers. They sure know how to make a mess. But these pet-specific detergents really help my carpet cleaner work out the messes easily. Read on to learn more about this excellent detergent. There are only 52 reviews for this product on Amazon.com so far. Most of the customer feedback is positive. Satisfied users love how it makes their carpets feel cleaner and smell fresher. Doesn’t seem so effective with pet urine – Some customers report that although this detergent usually does a good job of removing most stains, it can’t seem to handle animal urine so well. Shipping problems – There were some reviewers who unfortunately received their product in a poor state. Either the container was leaking or some of the detergent seems to have mysteriously evaporated. Luckily, Amazon was very quick to send replacements. Cleans effectively – Amazon users were happy to report that this detergent works as advertised. It does a good job of removing dirt and a variety of stains. The nice scent is an added bonus. Leaves carpets soft – Unlike other cleaning solutions that leave carpets feeling stiff, this formula seems to condition the fabric as it cleans. Your carpets end up feeling soft and nice to the touch. This detergent, although quite pricey, seems to be really effective in getting rid of dirt and practically almost all kinds of stains—perhaps except pet urine, which most customers pointed out, is rather challenging to get rid of. But generally, the Hoover Platinum Collection Pet Plus sounds like a good deal for your money.